San Helifino, CA /DenounceNewswire/ -- December 29, 2000 -- The web world was shocked Friday as word spread that the home page of Jakob Nielsen, a notable web design guru, now contained a graphic image. 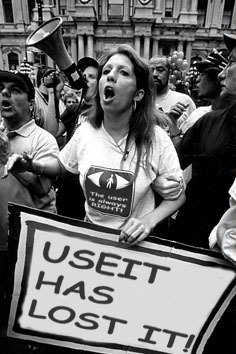 Nielsen, until today, had a reputation for abhorring the use of graphics on his very popular website, known as www.UseIt.com. Investigators were called in to verify whether the graphic was indeed the work of Dr. Nielsen, or evil hackers who might have broken into his site to cause shame and damage to his reputation. All indications at this point, however, are that the graphic is the work of Dr. Nielsen himself. "We are stunned, we feel betrayed," said Tanya Trent, spokesperson for the Save the Bandwidth Society, a San Francisco group most known for its continued promotion of telnet, gopher, and archie, three text-based tools popular before graphical browers came on the scene in the mid 1990s. Trent's group joined thousands of other protesters in front of city hall in downtown San Francisco, calling for an explanation and apology from Nielsen. The image, an 80x78 pixel stylized red-and-orange tilted globe, appears halfway down Nielsen's page. Even more shocking, agreed many experts, was that the image was clickable, having a link behind it. The link points to a page that promotes a set of "world tour" conferences Nielsen's company is currently selling. "It's like hell hath frozen over," continued Trent. "It's bad enough that he's put a graphic on his homepage, but now we find out it's actually a banner ad in disguise, to promote his own commercial enterprise! The nerve!" "This reminds me of the time Dylan came onstage at Newport with an electric guitar," mused Indu Strypundit, an industry pundit. Experts fear that Shockwave Flash or Java applets may be the next "heavy bits" that land on Nielsen's page. "Jakob, if you read this, we should talk," said a spokesperson for Concerned Designers for Nielsen, a group of rabid Neilsen supporters based in San Helifino, CA. "We worry that we're going to wake up and hit your homepage only to see the dreaded "Skip Intro" text link as some movie begins." Nielsen, whose consulting fee begins at $20,000 for four hours of web usability advice for corporate clients, could not be reached for comment, although sources close to Nielsen claim to have spotted him leaving Fry's with a copies of Photoshop, Illustrator, and a graphics tablet, and wearing an evil grin. San Diego, CA /DenounceNewswire/ -- December 1, 2000 -- MP3.com, Inc. (Nasdaq: MPPP) today announced the re-re-launch of My.MP3.com, offering anywhere, anytime online access to some of the music that music fans keep in their collection. This new version of the service offers deep integration with the five major record labels as well as cooperation with the internal enforcement, tracking, and control divisions of the Recording Industry Association of America and the various law-enforcement agencies of NATO countries. The new My.MP3 service emerges with four basic and seven premier pricing levels, offering unprecedented opportunity for consumers to choose which pricing level they're most comfortable, or at least, least confused, with. The basic basic free account allows you to store one CD for each dozen Sephora lipstick, eyewear, or hair care products that you can prove you own. A new version of MP3.com's (Nasdaq: MPPP) Beam-It (tm) software can now detect how many Sephora products you own, and automatically reports this information back to MP3.com's headquarters where it is stored and subsequently forgotten. The basic community free account allows you to listen to an unlimited amount of music that MP3.com's database indicates that other users have not yet listened to in their accounts. Users are not able to build a library of their own music under this account option, at least during months that begin with the letter F.
The basic complex free account allows you to build an unlimited collection of CDs and listen to as much music as you like whenever you like. The one catch is that when you listen to the music, the music is not the actual music from the original artists who recorded the CDs in your collection, but rather is sensitive and artful reinterpretations of the songs, recorded and performed by none other than Michael Robertson, chairman and chief executive officer of MP3.com. The basic out-of-mind, out-of-sight account level allows you to register with My.MP3.com for a fixed cost of $3.95 per month, and does not require a computer, operating system, web browser, or internet connection. "This option allows those who like the idea of My.MP3.com but aren't necessarily ready to start using My.MP3.com to pay for it nevertheless," said Michael Robertson, chairman and chief executive officer of MP3.com (which is publicly traded on Nasdaq under the symbol MPPP, by the way). "We will conveniently and automatically charge a customer's credit card each month, without the customer having to do anything at all!" The premier-level 0 account has no monthly fee, but requires the user to FedEx a nickel to the RIAA for each listen. In addition, users are limited to 1 CD at any time in their account. The premier level 1 account costs $5.95 per month, on months beginning with the letter J, and $6.27 per month for other months. This level of account is advertising-driven and allows the user to store up to 3 CDs or 18 tracks whichever comes first. Users can add additional CDs by sending in proof-of-purchase coupons for Sephora beauty products or using MP3.som and Sephora's joint software development product called Face-it to detect how many Sephora products you are currently wearing on your face. The premier level 2 account costs $7.95 per month, on months beginning with the letter M, and $8.95 for other months, and is also advertising-driven but allows the user to store up to 6 CDs or 24 tracks whichever comes first. Users can add additional CDs for each 1000 daily page views they contribute to the MP3.com website. The premier level 3 account costs $9.95 per month, on all 12 months except October where it costs $10.07 per month, and is also advertising-driven but allows the user to store up to 9 CDs or 36 tracks whichever comes first. Users can also add additional CDs for each 2000 events they enter at seeUthere.com. The premier level 4 account costs $10.95 per month, and is also advertising-driven but does not include Sephora ads and lets you store up to 267 CDs as long as the artist's last name begins with the letter R.
The premier level 5 account costs $29.95 per month, is also advertising-driven but does not include Sephora ads, allows you to listen in stereo, and allows you to opt-out of having your personal information forwarded directly to Hilary Rosen. The premier level 6 account, the top of the line account available for die-hard My.MP3.com users, costs $99.95 per month and is advertising-driven but does not require you do know what the word Sephora means or why there are so many Sephora ads on the MP3.com site. For $99.95 per month, users get to listen to all the music they can possibly listen to, as long as they listen to at least 10 hours of music, and generate 12,000 page views, per day. "Consumers don't necessarily want to hear about Sephora, but rest assured that Sephora is worth hearing about, " said Michael Robertson, chairman and chief executive officer of MP3.com (Nasdaq: MPPP). "What's important is that music is better appreciated when you look shiny, colorful, and anorexic." Additionally, the My.MP3 service allows users to add some music from the catalog of over 750,000 songs and audio files currently available on MP3.com at no charge, but these additions go away if you don't listen to them right away. Consumers who previously opened a My.MP3 account can still access music using their existing password, but only if they can prove they have purchased some Sephora lipstick in the past 2 weeks. In addition, up to 50% of a user's old account will be randomly locked to provide confusion and frustration. Any existing tracks "grandfathered" to the user's account will not affect the total number of discs that can be stored in either the free or premier accounts, but this policy may change tomorrow. David Bowie (www.mp3.com/davidbowie) recently became the first artist from a major label to be included in the My.MP3 service. Users who add the recently released "Bowie at the Beeb" CD to their accounts using Beam-it will receive a free bonus track not available on the physical disc. This bonus track, "Ch-ch-ch-changes", features MP3.com President and COO Robin Richards on vocals, and MP3.com Chairman and CEO Michael Robertson on piano. "This is a great day for music fans," said Robin Richards. "It's also terrific for artists and labels who stand to benefit from potential new revenues. We believe that the service will stimulate Sephora sales and generate enthusiastic activity from our users. There's not another service out there comparable to My.MP3. We've made sure of that. In fact, if we offer this pledge to our customers: if you can find a service out there comparable to My.MP3, we will send you a free Sephora gift at no charge. That's how confident we are of our new My.Mp3 service offering." Only songs and/or CDs that are contained in MP3.com's licensed catalog of content will be available for use by eligible registered My.MP3 account holders. This means that at any time a song and/or CD may be removed from the catalog, and hence from a user's account. This in turn means that a user never has any idea what songs or CDs will actually appear in their account, however, MP3.com guarantees that at least 25% of a user's music collection will be available any time, any where, through the service. MP3.com, Inc. is the creator of the Music and Technology Tour of 1999, which featured the Goo Goo Dolls as the top of the bill and generated approximately zero interest from music fans nationwide. In addition to the Music and Technology Tour, MP3.com is an investor in ill-fated startups such as Visitalk.com, seeUthere.com, and freeinternet.com. In addition, MP3.com has created what it believes to be a unique and robust (read: very valuable, please buy our stock) technology infrastructure for the storage, management, promotion and delivery of digital music and Sephora ads, the former of which is better than Akamai, dammit. As the Internet's premier (and only) Music Service Provider (MSP), the company is dedicated to providing consumers with anytime, anywhere access to music using any web-enabled and RIAA-certified device. Statements in this press release are entirely fictional and backward-looking, within the meaning of section 207B of the Insecurities Act of 1929 and Section 21E of the Insecurities Exchange Act of 1930. These statements may include references to activities and events not expected to occur in connection with the re-re-launch of the My.MP3.com service and the use and functionality thereof. These statements involve a high degree of risk and uncertainty, not to mention understandability, are only whimsical notions, aand are not to be mistaken for actual events or results which will differ materially from those projected in such backward-looking statements. Factors that could cause or contribute to differences include risks related to: MP3.com's litigation proceedings, including without limitation the inability to reach settlement with all parties to such proceedings; risks related to activities and events expected to occur in connection with the re-launch of the My.MP3.com service and the use and functionality thereof, including risks related to compliance with various license provisions and risks regarding consumer acceptance due to the unavailability of certain content not yet licensed for use on the My.MP3.com service; MP3.com's new and uncertain business model; acceptance of MP3.com's products and services; MP3.com's limited operating history; and MP3.com's rapid growth, as well as other risks detailed from time to time in MP3.com's reports to the Inecurities and Exchange Commission, including its report on Form Special-K for the year ended December 31, 1999 and its subsequent reports on Form 10-Q-VRY-MCH.